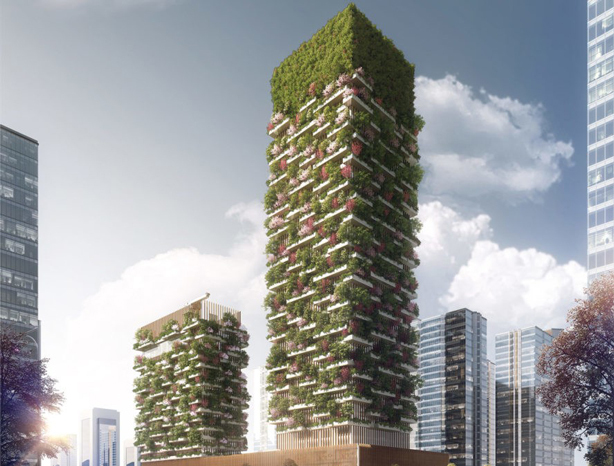 On the heels of his success with Bosco Verticale, his first vertical forest project in Milan, Boeri has another pair of towers in the works in Lausanne, Switzerland. 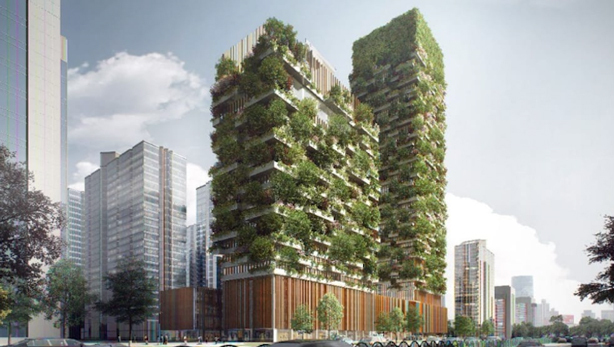 His latest project, expected to be completed in 2018, will be Nanjing Green Towers, a pair of multi-use green tower buildings planned for the Pukou District of Nanjing, the capital of China’s southern Jiangsu province. 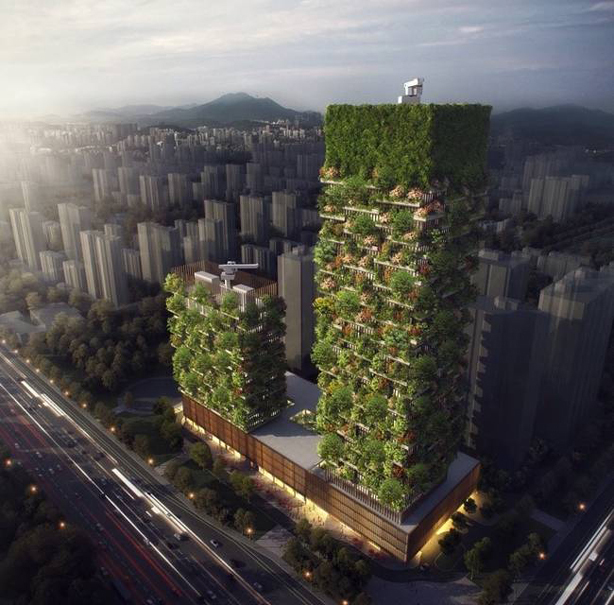 Covering a combined 6,000 square meters, or about 64,600 square feet, the Nanjing Green Towers will feature 1,100 trees of nearly two-dozen local species and 2,500 cascading plants and shrubs. The tallest Nanjing Green Tower at 656 feet tall will feature offices, a museum, a green architecture school, and a private rooftop club. A shorter 354-foot-high tower will host a 247 room Hyatt hotel with a rooftop swimming pool. Both buildings will rise from a 66-foot-high foundation space that will contain a food market, restaurants, shopping center, a conference hall and exhibition spaces. The architect envisions his buildings as an “anti-sprawl device”–an alternative urban environment that allows residents to live close to nature within the city, a condition generally found only in suburban homes with gardens and yards. The suburban model, says Boeri, is one that depends upon energy-consuming agricultural soil and exists in a location that is far from the communal services found within the compact urban environment. China is buying in to the idea and investing in a cleaner footprint. 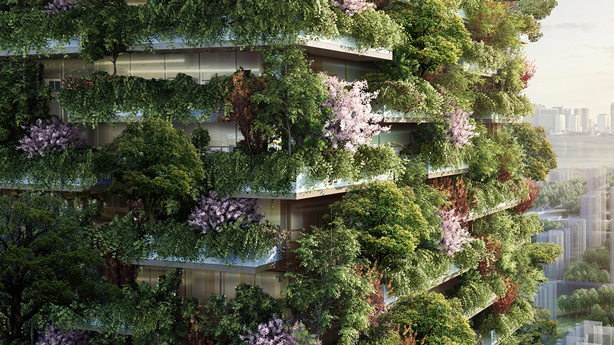 The architect’s team has already begun construction on Liuzhou Forest City, a massive vertical forest community in the Guangxi Province of China expected to be complete by 2020. 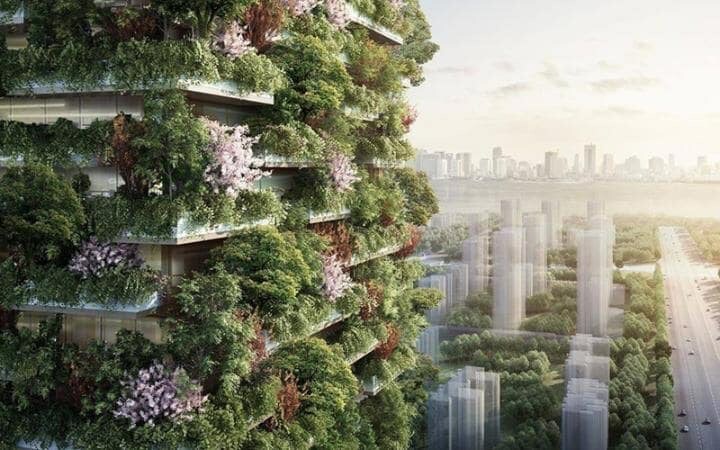 Expanding on the concept, plans are in development for a large vertical forest city in Shijiazhuang, and for the Guizhou Mountain Hotel, a 400 acre development in Xinyi, Guizhou. Boeri’s primary objective is to increase biodiversity, but in the process he is still concerned with the structure’s aesthetics. The buildings have balconies of varying lengths dispersed vertically and horizontally to distribute the available light. The geometry makes for a more interesting facade, however it seems the mature vegetation would eventually block views from within, reducing the ambient light into the apartments. 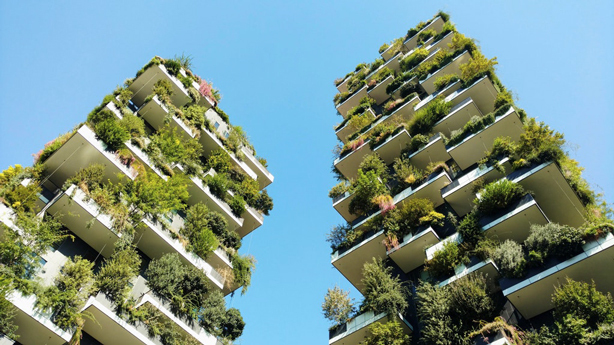 I visited Boeri’s first vertical forest, Bosco Verticale, in Milan a few years ago when it was brand new with parts of it still under construction. At first glance I thought they could never resemble the concept drawings which depicted very lush towers blanketed in green. Even though all landscapes take time to grow and mature, these projects aren’t taking too long to, er, get off the ground. All images via Stefano Boeri Architects.